This picture is from the entrance at the street. Why? Because I want you to get out of the airport quickly so you can to save money from the beginning of your stay in Nepal. If you don’t arrive at night or on a holiday and do not have too much luggage, walk down to the street. It’s only .3 KM. Cross the street and take care of your needs there. 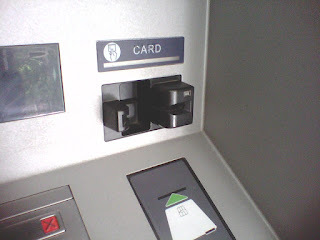 Be sure to always use this type of ATM machine that allows you to hold onto your card. You will pass the Flat Rate Taxi Service counter at the airport. If you chose to have them provide a taxi you will pay at least 150 NRs. more than if you go outside and talk with a cabbie yourself. When I tried to get a taxi from the bottom of hill it was about the same price. However, from what I understand, they have reduced the number of taxis at the airport, which is increasing the price. One day, while in Bhaktapur, I tried to get a taxi to go a short distance only because I knew the bus would drop us off at the bottom of a steep hill. The standard price was 1,500 NRs. I told the driver that I could see the temple from right where I stood-a slight exhageration, but got the ride for 400 NRs. What food is available there at the airport, like most airports, is overpriced and not very appealing. When you get to the street below cross the street and you will find some lovely, local restaurants with excellent prices; the signs will mostly be in Nepali, but as long as the restaurant has a front door it will be fine. Be sure to ask them to bring your drinks right away. Otherwise, drinks will come with the meal, which can take a bit longer than you might hope. This is typical of Nepali restaurants. My book readers will find this a bit redundant, as these cultural issues are discussed there. You can get your photos and copies of your passport to get a SIM card at the airport at a very good price, so don't leave until you take care of this. Step 1. NCELL and Namaste mobile phone stores are together and you will need to walk right past them. Although there are promotions going on all the time with the mobile phone companies, the savings are not always passed along to tourists at the local stores. There is no fixed price on the card, either. Although NCELL seems to be the biggest in the Kathmandu Valley, the other network, Nepal Telecom-Nameste, works better when you get outside the valley for trekking. They provide a great price on calling back home. It's less than 2 NRs. to call the US, with most other places costing more. It is the better network and a bit less expensive, not that it's a great expense, but don't be fooled into taking the NCELL card. They usually have better specials for the SIM card, but any savings will soon be gone and you will be paying more for your calls. Better still, get one of each. The networks get congested and you'll be glad to have a choice. This is a very expensive hotel and there is a restaurant next to it, but I don't recommend it. Step 2. Check at the Tourist Information Desk for their best price for a taxi so you will have an idea of how much to negotiate for, and head out of the airport. You can also get a good price on a room if you'd like. If you do not already have a room booked they can give you a good price and a free ride to the hotel. If you do not like the hotel you can pay the taxi driver a preset amount and find your own guest house. They will show you the rack rate from the guest house's brochure, call to confirm it and provide a free ride. This is the best way to do it if you come after business hours. Hopefully you will have taken the advice from our book and either booked for a short stay or just plan to show up. Step 3. After getting your SIM card go outside, turn right and go to the far end of the terminal to the Rastriya Banija Bank. One issue I need to mention is that this is an ATM machine that is just out in the open rather than being in an inclosed room. I wouldn't worry about it because the airport is well lit and plenty of security personnel. If you do not have any rupees with you it isn't usually a problem if you have either Indian rupees, Euros or dollars. Just be sure they give you your change in Nepali rupees. Do not let them just round up and forget your change. They never seem to remember to give change. How safe is it in Nepal for a woman traveling alone? One day I while waiting for a bus on the far side of Bhaktapur a young man started a conversation with me. He said he was waiting for a friend who didn't seem to be showing up. He said he was going and offered me a ride on his motorbike. It was only after he had come up for tea and left that I realized I could never have done that in my own home town in the US. They don't always just want your money, but if they do they require you to be smiling when it magically finds its way into their pocket. You are safe 999,999 out of a million times. 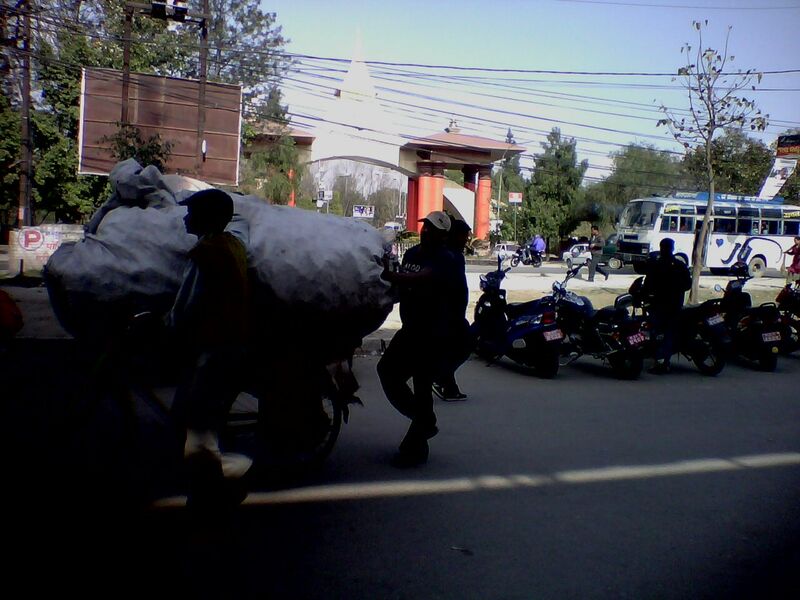 By far the vast majority of Nepali seriously only want to have a new friend. There are a few money changers along the street there. I checked at the airport and then found a much better rate at Ramaroshan Money Exchange (1.35 NRs. better) at the street below. The others were only about .50 NRs. better than at the airport. This is the first one you will come to after crossing the street; they are open 7 days a week until 7 pm. 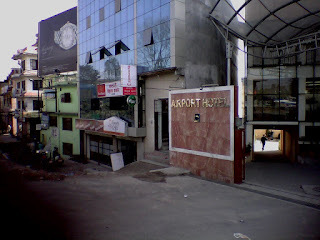 Ramaroshan Money Exchange, Airport Gate, Sinamangal, Kathmandu, Tel: 01-4498231. 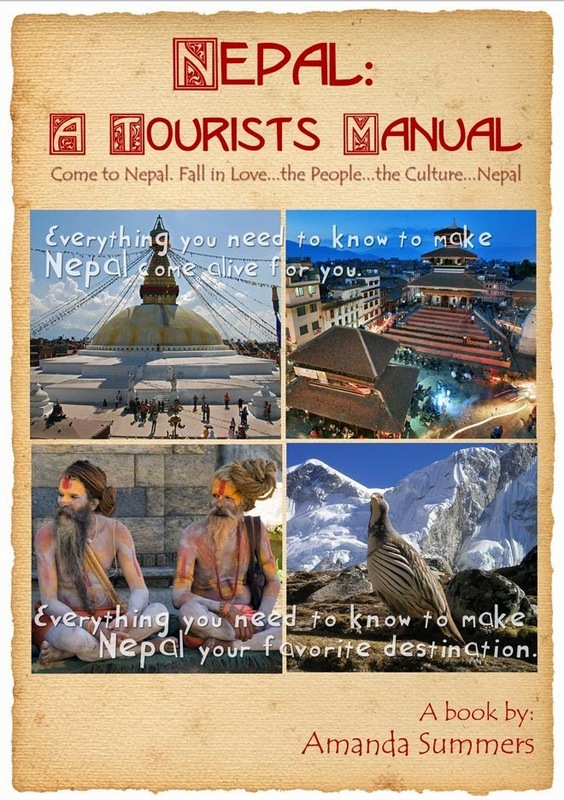 There are additional tips in the book, Nepal: A Tourist's Manual. A word about the Airport Hotel: This is a very nice, typically pricy hotel, probably about 3-4 Stars. Rooms start at about $100 (always quoted in USD), but if you ask for Nimesh Shrestha he can provide you a discount depending upon their availability. He offered me a $20 discount right away while I was trying to explain my reason for the visit wasn’t to book a room. He was quite nice and eager to be of service. I offer this hotel for those who need to stay near the airport for an early morning flight. There are a few other nice, new guesthouses nearby, the nice ones starting at around $50 and some very bad ones starting from 100 NRs. per night for a bed. For walking distance to the airport, I would suggest sleeping in your sleeping bag at budget places and checking for bedbugs. There is also a golf course next to the airport. Golf fees there are less expensive than the other courses in and around the Valley. Notice the Airport Hotel picture. There is a very inviting restaurant next to it, but I cannot recommend it. When I went there the waiter insisted that I pay for bottled water with my meal. All restaurants in the Kathmandu Valley, with few and very obvious exceptions, serve filtered water with all meals. It is actually safer to drink the free filtered water from restaurants than to purchase the 'mineral water.' Why? The government of Nepal inspects the bottled water treatment plants, but not the pre-bottled mineral water that may even be imported from India. A note about money: You do not actually have to use the ATM machine at the airport if you have some small US bills or Euros. Everyone loves dollars and Euros and will accept Indian rupees (but not the old 500 or 1,000 rupee notes). Just ask if your currency will be accepted prior to ordering at the restaurant or stop at the money exchange store. If you decide to take a taxi from the airport don’t worry about needing rupees; just make sure the driver doesn’t cheat you on the exchange rate. There is actually no official way to convert the rupee back into USD at the end of your trip, but the young man at Ramaroshan Money Exchange told me he can accommodate tourists as they are leaving. Do try to use your rupees up, as this is not a guarantee. My book lists some other options. This is less problematic as Nepal moves closer toward the 21 century and this issue may even be totally obsolete already. 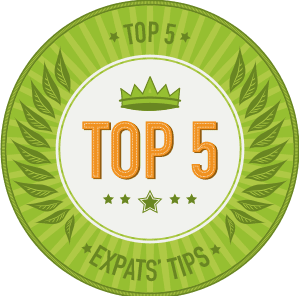 I hope this information is helpful and helps your vacation here to get off to a good start. There are many ways to waste money and many people just waiting to cheat you out of even more of it. Nepal is really a wonderful place, a magical place. My best advice comes from a very old man I once knew. “Watch your nickels and your dollars will take care of themselves,” he used to say. Rupees will pour like water through your fingers if you aren’t careful. 500 NRs. Taxi-If you decide not to stay at the guest house you can pay 300 for the taxi. 900 NRs. Room discount from the rack rate through the Association of Tourism. Keep in mind that $20/$30 (out of season/in season) can get you a fairly nice guest house room. 2,100 + NRs. Total savings. Actually, you will have saved a lot more if you count not thinking you have to pay for water in restaurants, etc. Love your new comments. Blog looks great. Wonderful goods from you, man. I’ve understand your stuff previous to and you’re just extremely great. I really like what you’ve acquired here, certainly like what you’re stating and the way in which you say it. You make it entertaining and you still care for to keep it wise. I can’t wait to read much more from you. This is really a tremendous web site.